← You grew HOW MANY kinds of melons? We are in a part of the crazy where… it’s not so crazy. So I’m taking advantage of it while I can. Plus I need to get all garden jazzed for the fall planting which starts September 1st! I know, that’s wild to even think about. I would like to have the fall garden MOSTLY planted out by the end of September. I will leave some of the melons and certainly the peppers through October at least. The Fall pepper harvest is the BEST part of the peppers. The plants are mature but not tormented by the heat. The peppers grow nice and big and plentiful. It’s exactly what I’m looking for. But as of now… tomatoes are gone. The trellises that supported the tomatoes are out. This whole system just didn’t work great this year for the larger tomatoes. The small tomatoes loved it and we loved them, but need to figure out something better for the big tasty tomatoes. 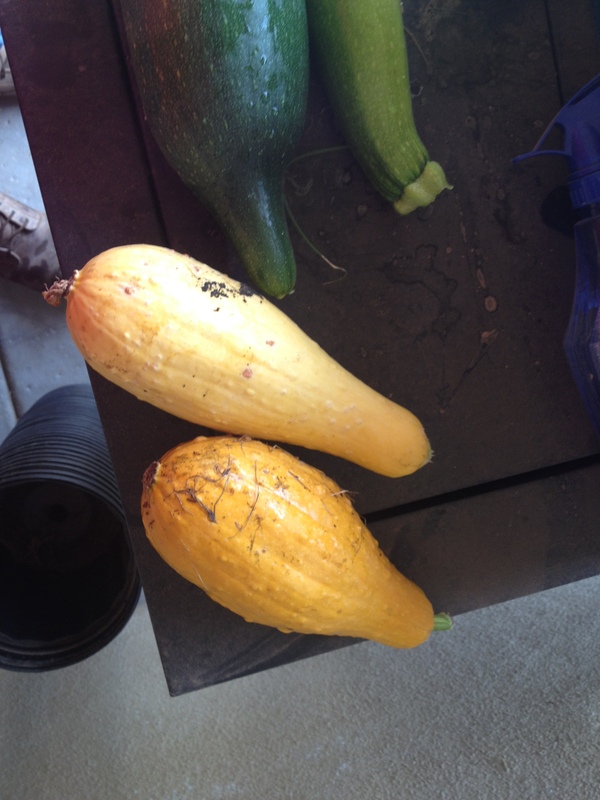 All of the yellow squash plants are done. We’re still getting random zucchinis that are good but even the smaller yellow squash are instantly dark colored and hard. It’s almost like they are ripening immediately. The one on the bottom there practically required a chainsaw just to cut it up for chicken feed. 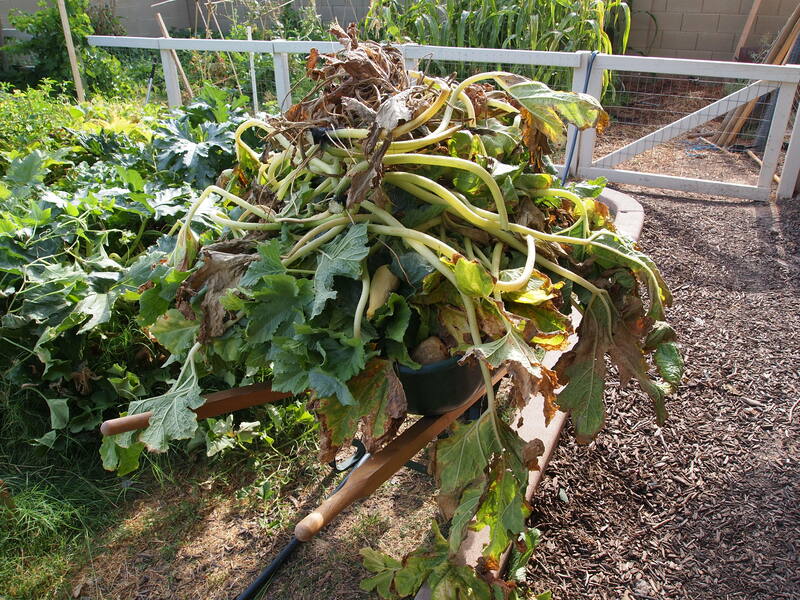 This bed was full of yellow squash but they got pulled and filled up an entire wheel barrel. I fought against the squash bugs all summer. Squish, squish, squish! It’s kind of twisted, but the smell of squash bugs in the morning is taking on a similar “get your day going” kind of feel that fresh coffee has. Yah, that’s not good. I think I’ll actually miss that smell. Cucumbers are rolling in. 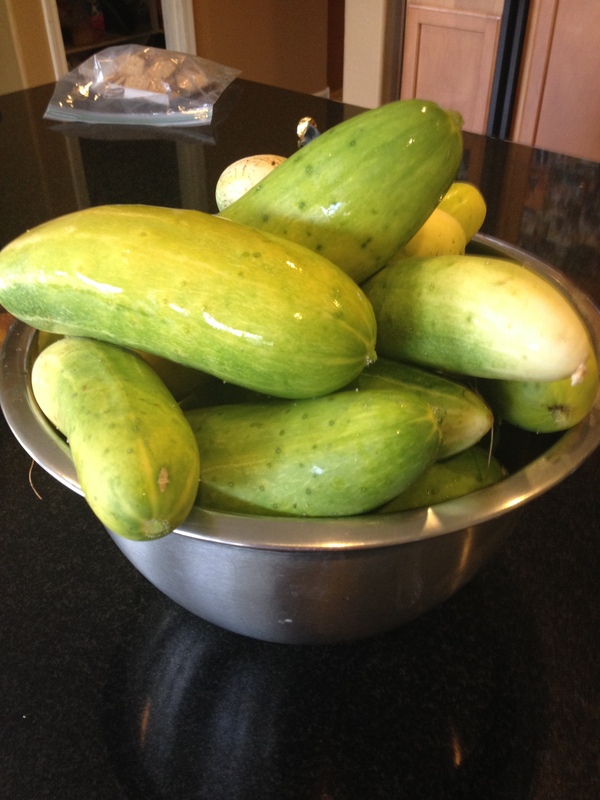 I planted pickling and salad cucumbers this year and both have done really well, but the salad ones are going nuts. I love it. We’ve made 10 jars of relish this year. I tried making some dills, but the results were kind of mushy. Not bad, just… not great. Most of the beds are still a jungle and need lots of clean up in the next couple of weeks, but fortunately we got a really good rain last night and this morning. You see in Arizona the whole city stops for rain. People don’t know how to drive in it. Some crazy people take pictures of it… If you have friends on FB that live in AZ it’s almost guaranteed that you’ll read about it. I’m guilty. I love it. It’s SO RARE here. Gotta enjoy it while it lasts. I’ve got my plan together for the fall garden, now I just have to execute and start some seeds… in doors… in the AC… since it’s still hitting 100 degrees. Cabbage, broccoli, and cauliflower don’t really like 100 degrees. This entry was posted in Arizona Garden. Bookmark the permalink. Your garden doesn’t look so small to me! Guess no matter the size, more would always be better. I currently have 634 sq ft of garden space and some containers. That’s six raised beds and a main garden. Of course that shrinks significantly in winter because of limited sun. 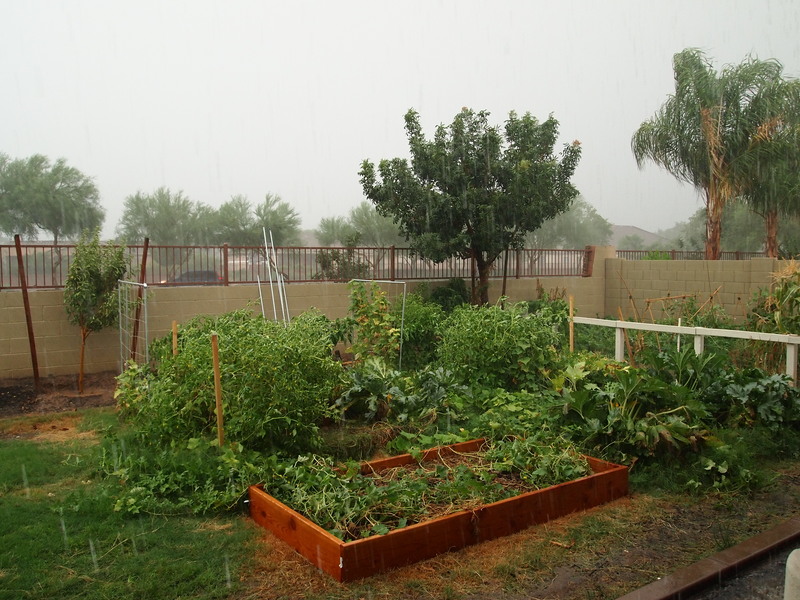 A two acre garden could definitely provide all of our veggies for our family of six, and probably a lot more. It’s great that you’re still getting cukes. 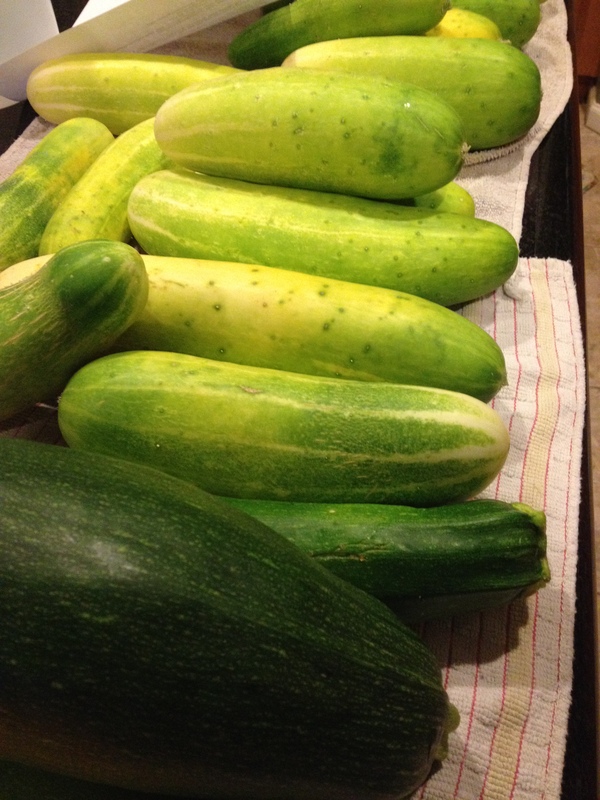 Our’s bit the dust along with the squash and zukes. Most of the tomato plants are history too now, but thankfully we have another garden that I planted later starting to come in. My watermelon garden is so overgrown with weeds that I have to walk carefully through it, feeling around with my foot for the melons. 🙂 I’d like to be planting our fall gardens now, but it rained over 5 inches over the last week and the soil is just too muddy to work. We’ll probably be planting the same time you do. We’ve actually had rain again last night. Wahoo! That’s two days this summer where I didn’t have to water the garden… not that I mind. 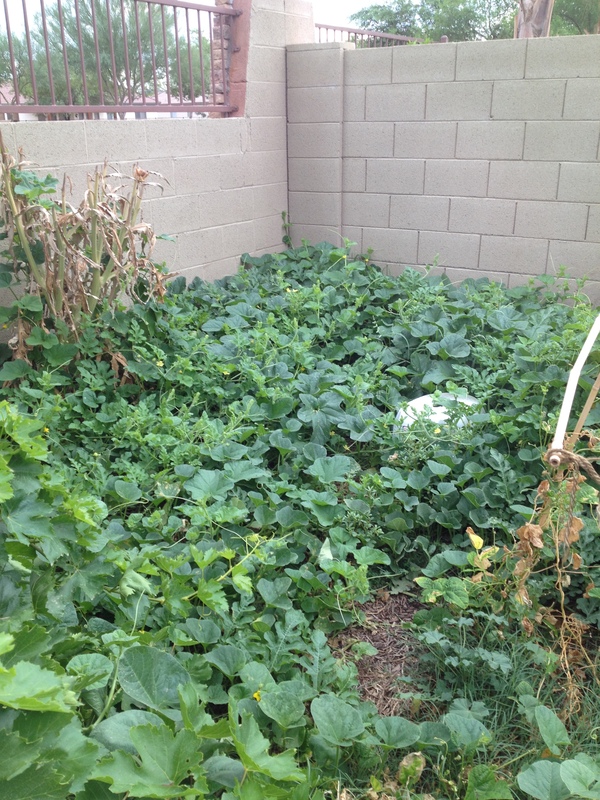 Not too many weeds in our melon patch but really no where to walk. I stand on the stool and use a piece of bamboo to poke around. you crazy! missing the squash bug stink??!! hahahaha! 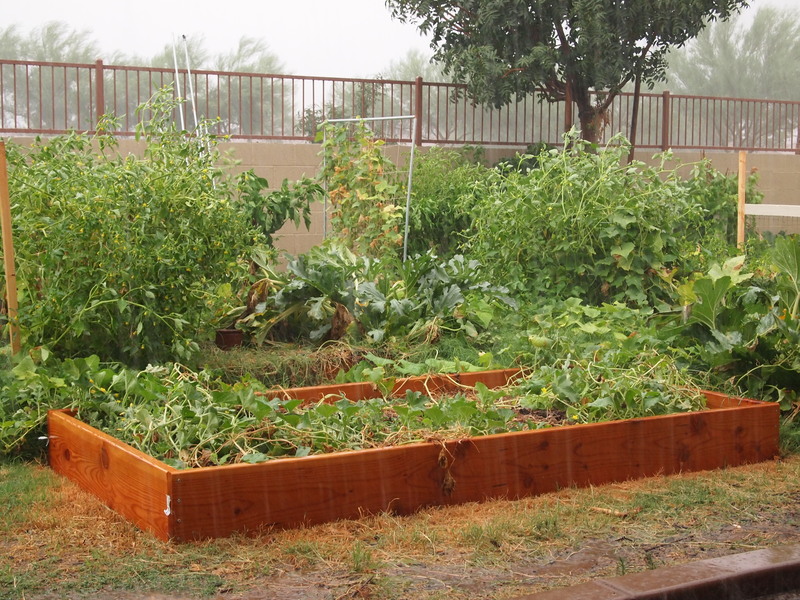 Gardening in the summer in Arizona? Is it hard to keep the plants alive without a ton of watering? Do you have to limit what kind of vegetables you can grow? Hi. I just thought I’d pay a visit from my world of being a weather geek to give you a “heads up.” Some of the weather models are seeing a tropical storm getting sucked north to Arizona next week by a trough swinging down from California. The storm should be off Baja by Sunday, and either will head harmlessly out to sea, or take a right turn and cross Baja and head up the Gulf of California. If it takes option 2 you could get a pretty good soaking. I had a cool summer up here, and never had to water. My Indian corn is ridiculous. It has ears eight feet up and the tops are fifteen feet high . However the coolness and dampness allowed some fungus to start up in the depths of my lush and towering tomato plants, and with shocking speed it spread and killed every plant, as well as the potatoes. It took only a week. Now I have an inkling of how the Irish felt when the blight wiped out their potato crop, and they faced their terrible famine. Fortunately I am not depending on my garden for food. I don’t think I’ll ever let my tomatoes grow so thickly again. I’ll take the time to nip off all the suckers, so the middles get plenty of air. You are lucky I don’t live in your neighborhood, because I think I’d be after your melons in the dead of night. Well you were right about the storm. I was out of town at the time, but they were even canceling schools. Can you imagine that? Canceling school for rain. We’re kind of crazy here. Looks like Norbert fell apart, though its east side shoved a lot of moisture up your way. 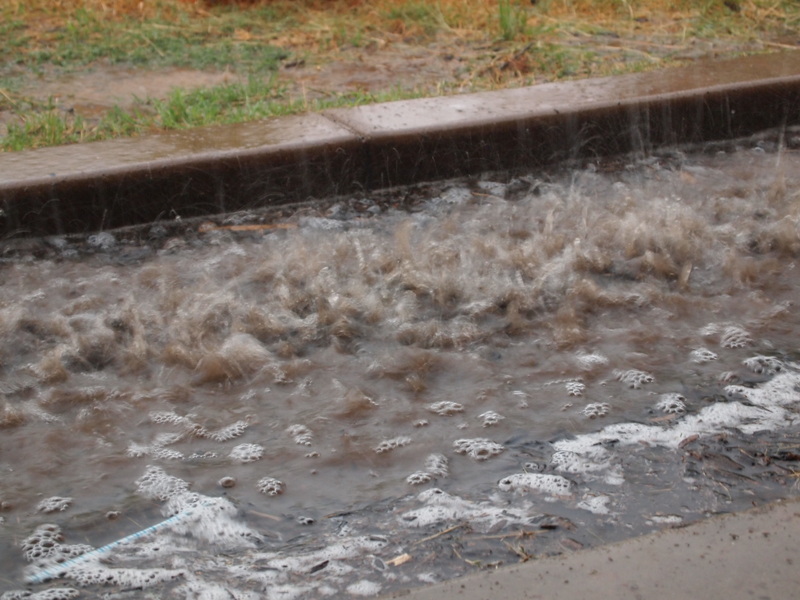 The media is all excited about record-setting rains, but I suppose it was localized. Did your neighborhood get much? Don’t lower your guard. It looks like another tropical storm could try to come north next week. We got plenty. More than a third of a year’s worth in a day. Hopefully more tomorrow. And now here comes Odile. If you do get a gullywasher, I hope you write about it in your inimitable style. And then don’t lower your guard. A third disturbance is brewing to the south of Odile.